The ‘Hoxne Hoard’ was discovered in Suffolk in 1992 by a metal detectorist looking for his friend’s lost hammer in a field. He found the hammer too. The story of the discovery is told on the village’s website and, for younger readers, on the BBC Primary History site. Its nearly 15,000 coins and 200 other gold and silver objects are the largest collection of Roman silver and gold ever unearthed in Britain. They represent what were probably just the more mobile parts of an enormous wealth belonging to a family from the island’s super-rich elite. Today it can be enjoyed by anyone visiting the British Museum in London (currently in the Weston Gallery, room 49). 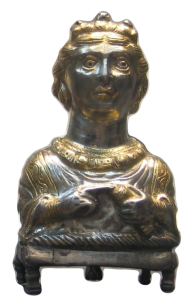 One of the more memorable and certainly most characterful pieces is a pepper pot formed into the shape of an imperious-looking Roman matriarch. She seems surprised to find herself in her current surroundings. The author was inspired to write the story of ‘The Silver Empress’ having listened to a programme broadcast on Radio 4, written by the then director of the British Museum, Neil MacGregor. It described the empress pepper pot and its significance, as part of the ‘A History of the World in 100 Objects’ series.